by Lundin, G. Edward, Lundin, Anne H.
Lundin, G. Edward, Lundin, Anne H.
Twelve experts address contemporary religious issues and literature in this fascinating group of bibliographic essays that cut across faith and denominational boundaries. The result is an enlightening overview of organized religion and spirituality today. Topics include the African American Church, ecology and religious responsibility, spirituality and aging, fiction for the faithful, feminism and theology, Judaism, Islam, Latin American liberation theology, developing a church library, and world religions. 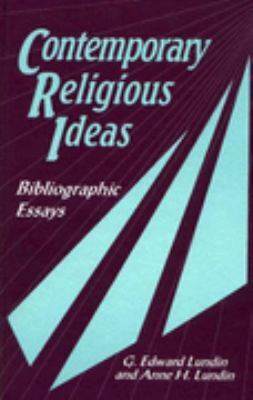 Designed for collection development librarians, pastors, rabbis, and religious study group leaders, this collection offers an introduction to each subject covered and lists resources for further study.Lundin, G. Edward is the author of 'Contemporary Religious Ideas Bibliographic Essays' with ISBN 9780872876798 and ISBN 0872876799. Loading marketplace prices 3 copies from $5.48 How does the rental process work?